The policy support + incentives being provided by the Union Government is generating investor interest in the Renewable Energy sector. An installed capacity of over 260 GW notwithstanding, India’s power generation has struggled to keep pace with its rapid economic growth, rise in population, growth and rampant urbanisation. Energy demand has perpetually outstripped supply by a wide margin, and with the 12th Five Year Plan (2012-17) targeting annual GDP growth of 7 – 8 per cent, a significant increment in energy supply is crucial to match the ever-increasing requirement. This rising energy demand, coupled with less-than-expected improvements in the production of domestic crude oil, natural gas and coal, has led to a strong reliance on imports. India racked up one of the highest energy import bills in 2012-13 (over $100 billion), and though the pressure has eased at the moment due to the softening of global crude prices, a long-term solution has become critical. Consequently, over the past few years, India’s energy security has become a key driving force of its economic policy. With substantial expansion required in energy infrastructure, India now has the opportunity to create a clean energy industry to increase installed capacities while reducing the deleterious impact on human health, environment and the climate. The Indian Government has taken several steps in this direction. For instance, for the long-term, measures have been taken to diversify the fuel mix, increasing focus on renewable resources in order to reduce reliance on conventional fuels, in particular, coal. 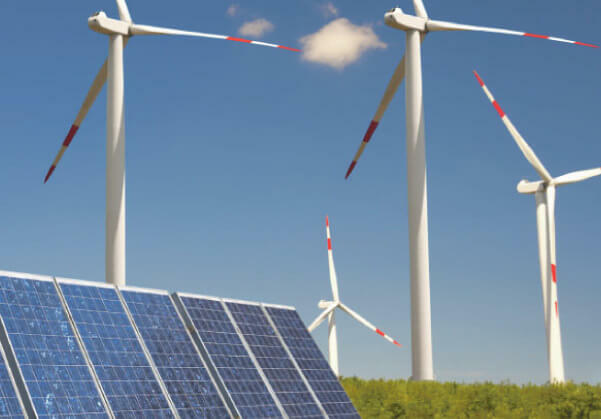 Though presently both wind and solar technologies are manufactured in India, the former is better established by far with a capacity of over 10 GW, while solar manufacturing has yet to gain traction with only about 800 MW on offer. This is a function of the relative maturity of each sector - wind deployment preceded that of solar power and hence dominates the market, but it also illustrates other issues such as the global dominance of nations like China which has reshaped the solar PV manufacturing landscape over the past five years. India is a key exporter of wind turbines, with a mature manufacturing base that has grown in parallel with the deployment of wind projects in the past decade. This has led to a diverse market of manufacturers who are very cost competitive due to lower production costs. Important export markets include South America, the USA, Europe and Australia, but there is rapidly increasing domestic demand as well for RE equipment. Several policy levers have propelled the growth of this sector, like the launch of the Jawaharlal Nehru National Solar Mission (JNNSM) in 2010, which helped solar development gain ground. This was further bolstered by several states launching state-specific solar policies featuring a gamut of fiscal and tax incentives to supplement the policy support mechanisms already in place. Historically, the Central Government – administered by the Ministry of New and Renewable Energy (MNRE), with funds disbursed through the Indian Renewable Energy Development Agency (IREDA) – has offered two types of incentives for RE – Accelerated Depreciation (AD) and Generation-Based Incentive, besides capital subsidies for biomass and small hydro. In the recently-started Phase II of the JNNSM, a new mechanism – Viability Gap Funding (VGF) – has been created for solar projects. The state regulator-led RE support mechanisms include the Renewable Purchase Obligation (RPO) which states that distribution companies need to procure a certain percentage of electricity from renewables, and feed-in-tariffs. Also, with the Government allowing 100 per cent Foreign Direct Investment (FDI) in renewables, the sector witnessed cumulative FDI inflows of over US$ 3000 million from April 2000 - March 2014, as per the Department of Industrial Policy and Promotion. At the moment there are huge investment opportunities in the Indian RE sector. The new Union Government, led by Prime Minister Narendra Modi, has made infrastructure growth a national priority, and expects this sector, along with manufacturing, to drive the economy in the next five years. In line with this vision, the MNRE has scaled up renewable targets manifold to about 175 GW by 2022, with solar and wind-based power accounting for over 90 per cent of this volume. Achieving these targets will largely be contingent upon the business case for investments in RE as scaling the market up to these levels cannot be sustained by subsidies. Cognizant of this, the Government is in the process of putting in place critical policy levers including Amendments to the Electricity Act, 2003 whereby stringent penalties will be imposed on defaulters for not complying with Renewable Purchase Obligations. Further, an RE generation obligation (RGO) may be imposed on conventional power generators, and a national RE policy is in the making. Meanwhile, the sharp decline in solar costs from INR 20 per unit a few years ago to about INR 5.5 now has made the business proposition for investments in solar exponentially more attractive. The Government is also considering graded tariffs to achieve grid parity, provide investors a fair return on investment over the lifecycle of the project, and bring in an entity to provide power purchase assurance to investors. To ensure the ease of doing business for both global and domestic investors, MNRE is exploring plug-and-play solutions for solar plants, by installing 20 GW capacity via solar parks in key states where all approvals, land acquisition and evacuation arrangements will be pre-made for companies wanting to set up shop. Global manufacturing companies can set up base in India, capitalising on its low-cost labour, favourable policies and tax incentives, making the country a hub for the export of RE equipment. Moreover, the business case for investments in RE, particularly for large investors, is very strong given the benefits of AD and strong balance sheets, which may be leveraged to avail lower interest rates. All this will help take the cost of solar power below Rs 5 - at par with conventional power - thereby completely changing the economics of the energy business. As India’s renewable energy sector marches from the margins to the mainstream, numerous opportunities are becoming available to work in tandem with global counterparts. International cooperation in RE research is essential to expedite the identification and development of solutions to meet ever-augmenting demand for affordable, non-polluting and renewable energy. To develop these cost-effective technological innovations, the need for active collaboration between industries and academic institutes, as well as research partnerships between developed and developing countries cannot be over-emphasised. For example, India can leverage the best practices and technological expertise of countries like Germany to develop a robust interstate transmission network to evacuate power, a system that is almost nonexistent in India. Similarly, the multinational models for clean energy finance, which are being adopted by countries like Spain, Italy and Germany to reduce policy risks and speed up project development, can be shared and customised for application in the Indian context. Given that governments hold the power to create markets and policies that accelerate development and deployment of clean energy technology, it is heartening that the Indian Government is deeply committed to the nation’s transition towards more sustainable sources of energy. The clear and predictable policy support, along with reformatory incentives, being provided by the Modi-led Union Government is vital to generating investor interest in this sector. All these developments are slowly but surely coming together to put the Indian renewable energy sector on a strong growth trajectory by not merely tweaking existing systems, but changing the paradigm altogether. In fact, driven by a conducive policy framework and private sector investments, India’s installed renewable energy capacity has doubled from about 17 GW in December 2010 to over 34 GW today, accounting for 13 per cent of the fuel mix. At present, with over 22 GW, wind power accounts for nearly 65 per cent of the total renewable capacity in the country, followed by small hydro power (4 GW, 11 per cent of the capacity). While solar capacity is trailing considerably behind wind power at about 3 GW, it has witnessed a hockey stick growth in the last four years, increasing ten-fold from a meagre 36 MW in 2010. Given the huge potential, this growth trajectory is expected to be sustained. Interestingly, this sector has seen strong private sector participation, accounting for over 80 per cent of the installed capacity, a promising trend that looks set to gain momentum going forward.